One significant structural problem that the boat has already weathered is that one of the cap-shrouds came loose. These are 1/2 inch steel cables that run from the sides of the boat almost all of the way to the masthead. These lines serve to keep the mast upright, far too difficult a job for the mast mount itself, especially when the wind is coming from the side (beam) and we are sailing. We were on a rather rough crossing, and suddenly the leeward (downwind) cap-shroud came loose. Essentially, it turned into a 55-foot steel whip. To make matters worse, it could have dismasted us if we had tacked even a little, putting the strain on the now-disconnected cap-shroud. Thankfully, my dad saw the flailing cable, and went forward with a friend of ours to try and get the cap-shroud back into its turnbuckle. This would never be extremely easy, but the wind was blowing and the boat was rolling and slamming (fortunately, not heeling) so much that even standing upright was virtually impossible. As if this weren't enough, we were taking waves crashing over the bow every few seconds, some with enough force to literally wash people down the deck. We are still here, with mast still upright, and cap-shroud securely connected, due to several things. First, we had a big (24 in. or 60 cm.) pipe wrench which we could use to get enough torque to wind the turnbuckle on. Second, we had two (not counting myself) large strong people who could take the waves and force the cap-shroud back in. Third, we got lucky. It is possible we could have tacked, or even hit a wave in such a way that the mast's weight was pulling on the weak side. The cap-shroud could have stripped the turnbuckle coming out, instead of merely working loose. My dad could have been hit hard by the flailing shroud, and been injured or thrown overboard. The waves might even have washed somebody through the gap in the netting on the lifelines that is next to the cap-shrouds, where there is no toe rail to lash the netting to or catch you as you slide. 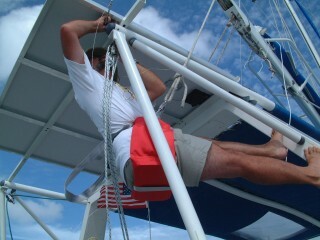 When we got back to SXM, we worked on fixing the rigging. First, we loosened the rig somewhat. We then had to get to the cap-shroud and forestay turnbuckles. The starboard turnbuckle, which had not come loose, was seized. To release it, we had to use a blowtorch and a lot of lubricant, plus a pair of big crescent wrenches. When we were able to work the rig, we used our main halyard as temporary rigging and loosened the cap-shrouds. We then loosened the forestay to rake the mast back some more. This should bring the bows up, and reduce the amount of water we take over them. We then tightened up the two cap-shrouds and put in pins that will prevent them from working loose again. The other structural work on this boat is less exciting, but still very important. On of the first things we had to do on Ocelot was put up solar panel supports. We got some specially made pieces of aluminum, one square and one a 90° angle, and painted them to match the boat. We then put them up on the dingy davits. The square one went at the back to support the rear end of the panels. The angled piece went at the forward end of the panels, to hold them in position. The solar panels went up easily enough, but we found out we had a problem. The davits, made to support the relatively light dinghies and engines the charterers receive, were not strong enough for our heavier engine and our solar panels. The horizontal poles that support the davits were bending. Clearly, vertical supports to the back of the davits were needed. We got two aluminum tubes with small, angled 'feet' which were loose so we could fit them to the boat. When we had the feet at the correct angle, we marked the position and took the poles back to the person who had made them. He welded the feet in position, and we bolted them from the back of the boat up to the davits.